Doctor-Bots constructed by University of British Columbia engineering students might be the forerunners of tomorrow's medical robots. 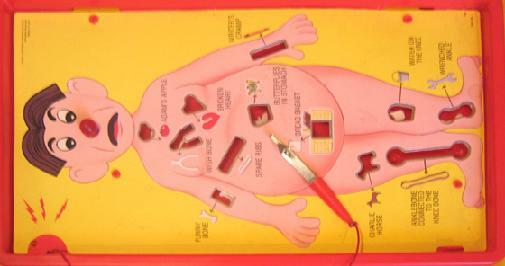 Today, though, they are playing an over-sized version of "Operation," the Milton-Bradley game. Second-year students work in teams to create prototypes of "surgical" robots. This year, fourteen teams put in 50-70 hour weeks (in addition to classes) to compete in the annual robot competition at their university. The objective of their version of the Operation game is to remove the most metal body parts in two minutes, without removing the wrong eye and without bumping the sides of the "incisions." The robots are built from scratch and are operated autonomously - no remote controls. The robots maneuver around the oversized "Operation" game board, and then try to "operate" by removing different parts. As you can see in the above video, some teams are have created more successful robot "surgeons" than others. It was a puppeteer-shaped coffin, form-fitted to Nessus himself, and bulky Puppeteer surgeons and mechanics must have intended that it should handle any conceivable circumstance. But had they thought of decapitation? Real-life autonomous robot surgeons are still some distance in the future; however, the Trauma Pod Battlefield Medical Treatment System is in the development stage and the LSTAT-lite Life Support For Trauma was recently demoed by DARPA. Surgeons are already making use of teleoperated (non-autonomous) robotic systems; see this article on the da Vinci surgical robot for a close look.